It's been a long time since I played Love Letters From Elvis, but reading it's one of the upcoming classic album releases from FTD I decided to give it a spin. I never understood why it was one of the first Elvis LPs released on CD, and after listening to this the "what was left from the 1970 Nashville tapes" album I still have no answer to that one. Admittedly, many of the tracks are among the weakest from this productive session. "When I'm Over You" is totally unforgettable and so is "If I Were You." After all, what can you expect with lyrics like "If I were you I'd know that I love me?" And "Only Believe" must be Elvis most boring inspirational song. That said, there are some fine moments, including the title track and the beautiful ballad "I'll Never Know." And then we have the highlight, the jam "Got My Mojo Working/Keep Your Hands Off Of Her" which is way above the rest and helps save the day. By the way, did you know Love Letters From Elvis was originally titled Festival? According to Ernst Jorgensen's book A Life In Music the title was changed when "The Sound Of Your Cry" and "Sylvia" were removed from the album and "Love Letters" added instead. Also, Colonel Parker wanted to add "Something" while Felton Jarvis thought "Hey Jude" would be better. Finally, they decided to include the Easter single "Life"/"Only Believe" instead. 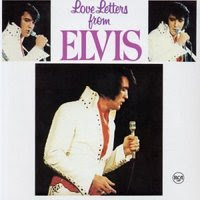 Personally, I think Love Letters From Elvis would have been a stronger album with both "The Sound Of Your Cry," "Sylvia" and "Something" on it (and "When I'm Over You," "If I Were You" and "Only Believe" out of it). Still, I'm kind of looking forward to the FTD release. It will be fun to have the "I'll take a piss in every fountain" take of "Heart of Rome" as well as the unedited, complete version of "Got My Mojo Working." I agree, it's strange that Jorgensen & Co included "Something" on the TTWII FTD. Especially since it's Jorgensen himself that points out that the song was considered for the Love Letters From Elvis album.